Born in Victoria, Lawrie is a self-taught artist whose unique drawing style has developed through his years working as a technical draftsman in British Columbia’s civil service. In 1987, life experiences caused the artist to focus inward, seeking ways of self expression. From this point on, his own style of pointillism and line drawing has been developing. He has always fostered an interest in the arts and has been encouraged through the artistic community. 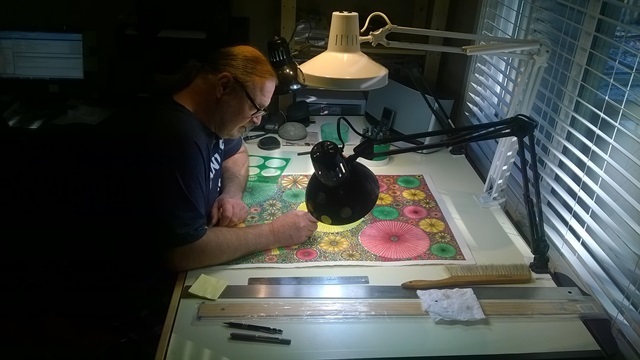 In 1990, Dignan apprenticed with a stained glass artisan who would become his mentor. This relationship had a very positive influence on Lawrie as it encouraged, supported and gave him the confidence to explore his own direction in drawing with pen & ink. That experience, and his years spent as a technical draftsman have strongly influenced the stylization of his landscape works. The contrast of natural and technical is very apparent in Dignan’s pieces. The subject matter is derived in part from photographs, natural landscapes and life experiences which are then rendered into his own stylized reflections. The pen and ink pieces become a filtration of those influences and like the artist, express a freedom and emotion that is orderly and controlled. Trees take on an architectural essence while the organic forms merge effortlessly with the hard-edged elements on the paper surface. Lawrie has participated in numerous juried art shows in British Columbia and was awarded a solo show at the 2001 BC Festival of the Arts. His works hang in private and corporate collections throughout the world.